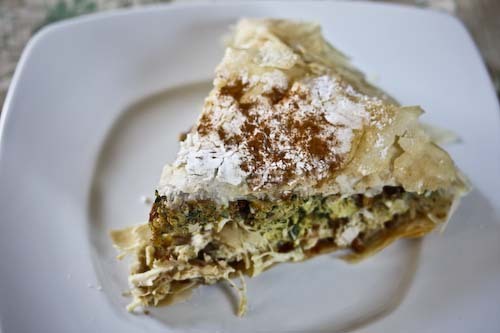 Paula Wolfert, in Couscous and Other Good Food from Morocco describes the traditional bisteeya of Fez as a 20 inch pigeon pie, bursting with two dozen eggs, layers of squab or chicken and sweetened almonds, all encased in the "tissue-thin pastry leaves called warka." This dish she calls "so grand, so lavish and so rich" you would think it would take weeks to prepare. In her memoir My Kitchen Wars by Betty Fussell, she claims to have made the bisteeya from Paula Wolfert "for which you roasted and boned a dozen squab, seasoning them with ginger and saffron and turmeric and cinnamon and ground almonds and beaten eggs and cupfuls of butter." But, as seems to be her way, Fussell exaggerates since the Wolfert recipe merely calls for 6 squab, or the substitution of 5 pounds of chicken legs and thighs. 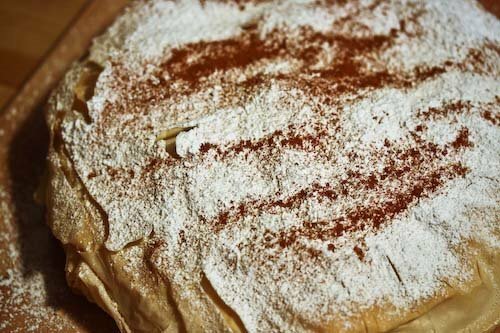 Wolfert also provides the recipe, and more importantly the process for warka, a Persian pastry not unlike phyllo. 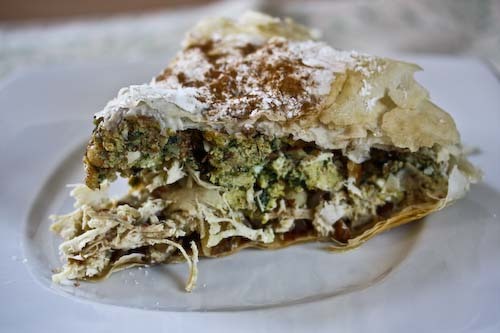 And unless you're truly crazy, or just that much of an overachiever, you'll stick to phyllo. In the interest of authenticity, Wolfert provides 23 pages on the history of bisteeya, as well as the method for making warka and several variations on the pie. That, is a lot of information. It doesn't have to be quite that hard. 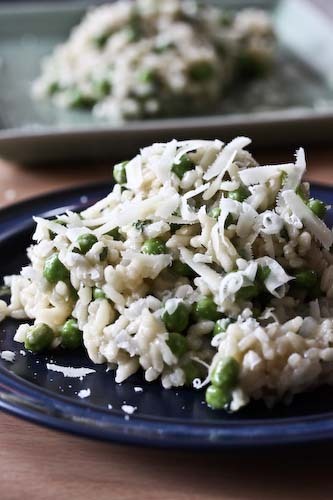 This recipe, from Rose Dosti's Middle Eastern Cooking seems just as authentic, is surely just as as tasty, and is scaled down to fit into a 10" skillet. It still takes quite a bit of time, but is somehow much less intimidating. She calls for only one 2 1/2 pound chicken, cut up, rather than half a dozen pigeons (which, although plentiful on the streets of New York, aren't as common in the grocery stores). And I have to tell you, I used two chicken breasts with skin and bone still intact, and two thighs, also with skin and bones. When working with fillo, you should try to keep the sheets moist while you're not working with them. So once they've been unfurled from their package, cover them with a damp cloth. Be gentle as you brush the butter on the sheets so you don't tear them. Otherwise, they're not hard to deal with at all. Place the chicken pieces in a large skillet and season with salt and pepper. Pour the oil over and add the onion and broth or water, as well as the saffron. Give it a quick stir, then bring the liquid to a boil. Add the cinnamon stick, reduce the heat, cover, and simmer over low for 1 hour. Chicken should be tender. Remove the chicken, but reserve one cup of the broth and discard the cinnamon stick. Allow the chicken to cool, then remove it from the bones and discard the skin. Shred the chicken, using two forks pulling the chicken in opposite ways. Return the one cup of broth to the skillet and bring to a boil. Add the parsley and cilantro, and simmer, uncovered, over low heat for about 3 minutes. Add the beaten eggs to the broth, and cook and stir them until they're scrambled and the liquid has been absorbed. Remove the eggs from the heat and set aside. In a small bowl, combine the ground almonds, the granulated sugar and 1/2 teaspoon of the cinnamon. Set that aside as well. Preheat your oven to 350 F and butter a 10" oven-proof skillet with rounded sides. You're going to place 4 fillo sheets in the bottom of the skillet, and as you do, brush the top of each sheet with a bit of the clarified butter. Stack the sheets in different orientations so the entire bottom of the pan is covered. Leave a 5 to 6" overhang. Sprinkle a third of the almond mixture over the sheets, then top that with half of the shredded chicken. Top with another third of almond mixture, then place half of the egg mixture over that. One more layer of chicken goes over that, then the last half of the eggs. End with the final third of the almond mixture. Fold the overhanging edges of the fillo dough over the mixture and smooth down the creases as best you can. Top with the remaining 3 fillo sheets in the same manner, brushing each with clarified butter. Fold the overhanging edges of the top sheets under the pie. Bake the pie for 25 to 35 minutes until the dough is golden brown and it's heated through. Cool slightly, then slide it onto a platter. If that feels too dangerous, just leave it, what the heck. Sprinkle with the powdered sugar and top with some cinnamon for garnish. Cut into wedges and serve. This makes 6-8 servings. Yum, love it!!! I just posted B'Steeya myself a week or so ago. What an amazing combination of flavors! I like the sound of this savoury pie. It looks really good! I've just made it. Yummy! Actually it takes time to make, however the result is just great. Bastilla is one of my absolute favorites. Thanks for sharing your recipe!